Welcome to another Good e-Reader Video! Today we evaluate the key differences between the latest devices to hit the market, the Amazon Kindle Fire and Barnes and Noble Nook Tablet. Some of the main differences between these two devices are on the hardware spectrum and the Nook Tablet edges out the Kindle Fire in a few areas. Both devices have a Dual-Core 1GHZ CPU processor and have a 7 inch display screen with a resolution of 1024×600 pixels. The Fire has Gorilla glass as the main display which has a more durable and longer lasting lifespan which is fairly important when you put it in the hands of kids. The Fire has 512 MB of RAM while the Nook Tablet has 1 GB. Storage space is a big issue with the Fire only having 8 GB while the Nook has 16 GB. The good thing with the Nook tablet is that you can further increase the memory up to 32 GB via the Micro SD Card. One of the big differences about these two devices is that the Nook has more physical buttons all over it which make it easier to use. There are volume buttons which is fairly important if you are listening to music with the screen off. The Kindle Fire makes you have to interact with the touchscreen in order to change the audio levels. I also am a big fan of the N button which brings up the main menu. The first thing users will see once they are past the initial setup of the device is the home-screen. The Kindle Fire has a very visually appealing 3D slideshow panaramic viewing of your most recent apps, books, wesites and other content. The drawback is that you have no control over this screen and despite the fact it is Android, you would never know it due to your lack of control. The Nook on the other hand gives you the ability to drag and drop apps, books, and other content right on your homescreen. You can also scroll to alternative screens and customize them. Both ecosystems are fairly different with Amazon offering more apps and video content while the Nook relies heavily on kids books, magazines and newspapers. 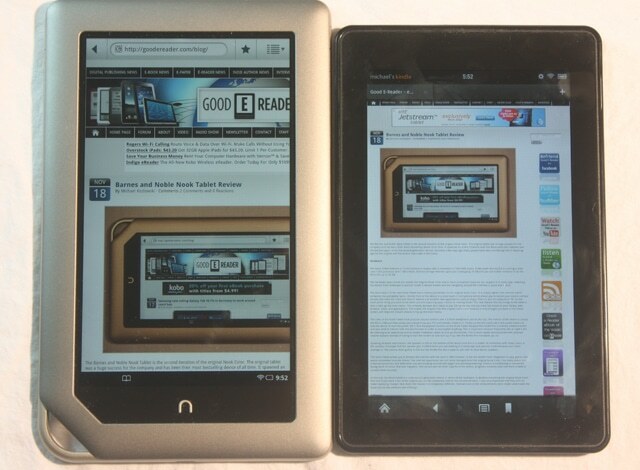 You could look at it this way; the Kindle Fire is more of a general purpose tablet while the Nook emphasis is reading. The libraries and shelving is vastly different with the ability to craft your own shelves and collections with the Nook Tablet. The Kindle Fire does not really allow you to alter the experience drastically but does have a “list” view. The reading experience is the same on both devices with the ability to switch your background for nighttime reading or to change the bright white to an easier color to deal with. You can change the linespacing, margins, fonts, font size and a myriad of other tools. You can also take notes and highlights and store them in the cloud to sync with your other devices. A neat feature is being able to lookup a word or phrase on Wikipedia or Google Search. I like the Nook Tablet better in the respect on when you are highlighting a word it gives you a little zooming lens above the word. With the Kindle Fire the zooming feature is on the word itself, and your finger is covering it up. We spend 30 minutes in this video going over every aspect of the device. You can see how the stores visually function differently and how media looks on the screen. We test ebooks and how the experience may vary between the two devices. If you are on the fence about either of these two e-readers, this video will be your guide to the key differences. But i would like to add that you cannot buy ebooks from the Barn and Noble NOOK store if you are not residing within the United States. If you like the Nook and live outside the U.S (like me) you have to buy your ebook on other websites. I thought it was worth mentioning it. 2) Use of VPN on the machines. I have seen some commentary regarding difficulty with that. Well many people simply just enter a fake USA address during billing and setup. The company never sends anything to your physical address only email. So you can use your real credit card to make purchases. A relevant point, at least in the U.S. is that the Nook is ePub compatible. The Fire is not. One can easily borrow library books, typically in ePub format on the Nook. That’s not an option on the Fire. it is confirmed at this time that many Kindle Fire units have faulty Wi-Fi and people have a lot of issues connecting to internet according to many user reviews. Amazon’s own web site has hundreds of reviews of Kindle Fire’s new owners that gave it 1 or 2 star reviews because of choppy/laggy experience they got from this underpowered device. All pro reviewers on the web clearly voiced that Nook Tablet is a much better device with superior performance compared to Kindle Fire. Nook Tablet that had been getting rave pro reviews on the web and it is the best device in it’s class. It’s got Netflix, Hulu, Pandora, Angry Brids, etc., the best battery life, the best screen, double the RAM and space for apps/photoes/movies, mmicroSD slot and a microphone for Skype (not on Kindle), physical volume controls on the side (not on Kindle), and much zippier performance during video playback and apps usage than choppy/laggy act of Kindle Fire according to many user and pro’s reviews. The Nook Tablet != Nook Color. Although the Nook Tablet can boot from the SD card the bootloader is signed and so only official Barnes and Noble kernels and ramdisks can be ran. This means that custom ROMs that you stated in your video will not be possible via the sdcard and may be close to impossible as well. Please update this information and correctly inform your reader/watchers that custom development on this platform, unlike it’s predecessor is not the same and they should NOT expect ICS or other roms to run on the Nook Tablet. The Fire on the other hand will be able to run other ROMs quite easily. Ouch! Deal breaker for me. I still love my NC but I was going to blindly pickup a tablet too on my next visit to the States, just for rooting and moding purposes. Thanks for the heads up! Thank you for the comparison! The video was really detailed and informative.